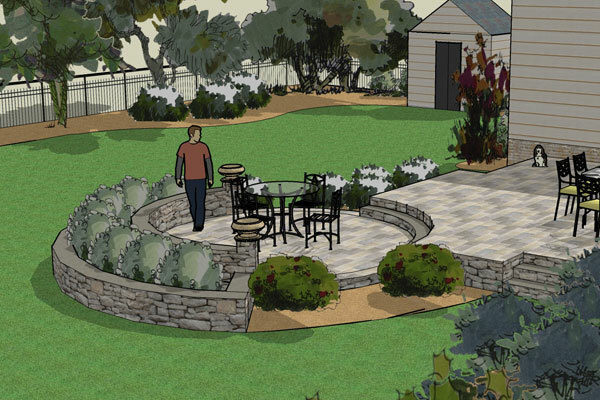 3D landscape designs are a great way to really see what your landscape will look like. 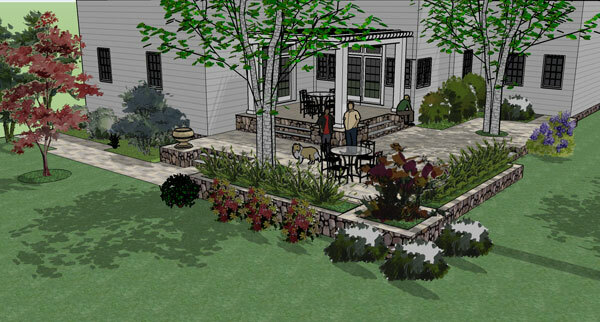 Amount of shade created, paving materials, plants, lighting and so much more can be shown. I can even turn it into a video animation! 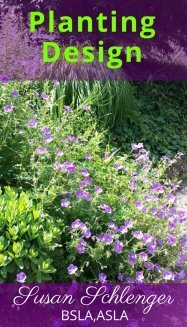 Here are just a few examples that I have provided to some of my clients. 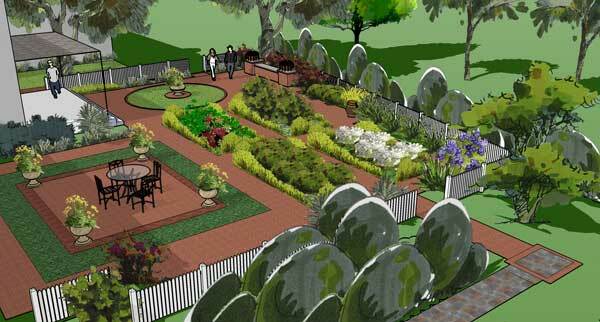 These designs are done with Google Sketchup. 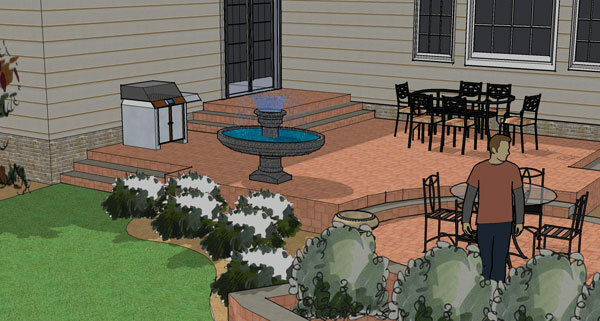 This 3D patio design shows how multi-level patios were created. It also shows how it looks done in bluestone with natural stone walls. There is also a pergola. These type of drawings are helpful in letting you see different levels. See the finished project which was featured on the Nate Berkus TV show. Here another two level patio. You can see how the landing looks, along with the steps down to the upper patio. There are also circular steps leading down to the lower patio. I can change the materials in this software very easily. 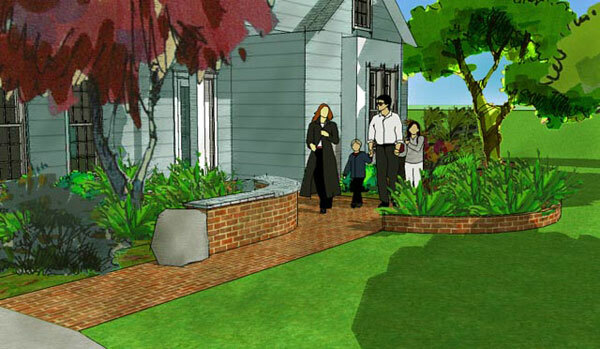 How about a paver walkway or a stone wall? 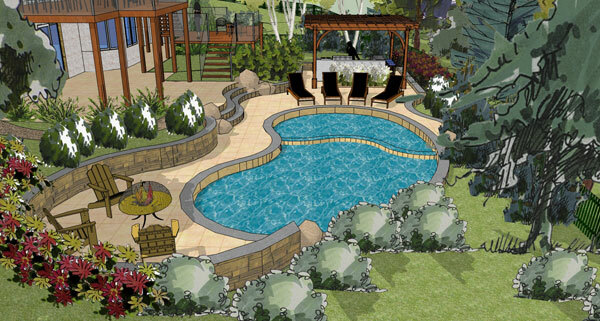 3D Swimming Pool Design - see the video of this design! These drawing are usually provided along with 2D designs done in AutoCAD, as was the case with the above designs. This is so everything is exact. First the design is done to scale in 2D and then the 3D images are created. In some cases, 3D designs can be offered alone.